We have a winner! A single ticket won the $768.4 million jackpot in the Powerball Wednesday night, cementing a spot for the winner (or winners) in lottery history. The huge sum is the third largest in the history of U.S. lotteries and the second largest Powerball win ever. In addition to this week's big prize, the top 10 has seen recent changes thanks to some historically big drawings recently. In October, someone in South Carolina won an estimated $1.5 billion in the Mega Millions drawing, which makes that lucky person the winner of the second biggest drawing in U.S. lottery history. Shortly after, two Powerball winning tickets were drawn in what is now the fifth largest drawing in the country's history. Here are the current 10 largest lottery jackpots and some of the lucky people who won big. Won Nov. 28, 2012. Winning tickets sold in Missouri and Arizona. Cindy and Mark Hill of Dearborn, Mo. said they planned on paying for the college educations for their four granddaughters and their four nieces and nephews. The following year, an email phishing scam reportedly used the Hills' name and the promise of a share of their fortune to acquire bank account numbers. Won Dec. 17, 2013. Winning tickets sold in Georgia and California. Ira Curry of Stone Mountain, Ga. said her winning numbers were a combination of family birthdays and the family's lucky number -- 7. San Jose, Calif. resident Steve Tran had purchased multiple tickets at multiple stores on his route as a delivery driver and realized he had been to the winning store in the middle of the night. Merle and Patricia Butler of Red Bud, Ill. kept their win a secret for nearly three weeks before coming forward to claim their prize. The couple, married for 41 years at the time of their win, said they planned to buy a new car and attend a few St. Louis Cardinals games. Last year, someone claiming to be Merle Butler on Instagram said he was giving away his winnings, but Butler told TMZ he didn't even have an Instagram account. The Maryland winners referred to themselves as "The Three Amigos." All worked in Maryland's public education system and pooled their money to buy 60 tickets. They joked that they planned to celebrate their win by getting matching tattoos of the winning numbers. Won Oct. 27, 2018. 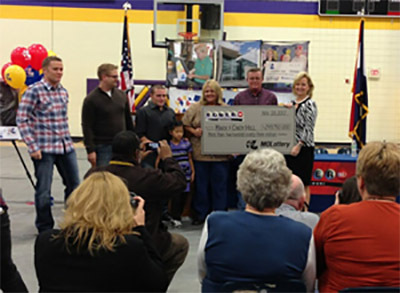 Two winning tickets were drawn, one in Iowa and one in New York. Half of the winnings went to Robert Bailey of New York City. Bailey told Powerball he would do the right thing with the money. He added that he would also remain a lottery player, saying, " I will continue playing my numbers until this train runs out!" The Iowa ticket was won by Lerynne West of Redfield. Redfield is a central Iowa community of about 830. West told the Powerball that her ticket had been misplaced for a time, but they eventually discovered it on the floor of her sister's truck. Her family established a charitiable foundation, but West also retired and said she was also looking forward to buying a new car and going on "a long vacation - or several." Won August 23, 2017. The largest jackpot for a single winner. The lucky ticket was sold in Chicopee, Massachusetts to Mavis Wanczyk. Won March 27, 2019 by a single ticket in Wisconsin. Before taxes, the winner will have the choice between a one-time lump sum of $477 million or an estimated annuity of $768.4 million paid out over 29 years, according to the Powerball. Nine other tickets scored either $1 million or $2 million by picking every number except the Powerball. Won Oct. 23, 2018. The lucky winner lives in South Carolina, one of only a handful of states where you can choose to remain anonymous and still claim your winnings. She did not come forward to claim the cash prize until March 4, just a handful of weeks before the deadline to claim. She did take advantage of the option to remain anonymous, asking through her lawyer for that decision to be respected. 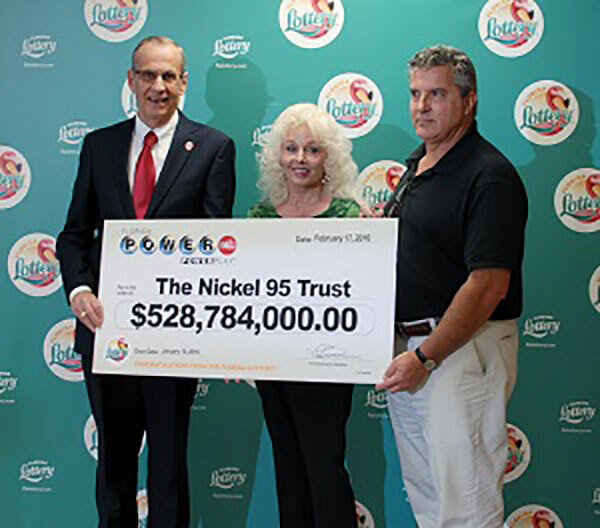 As for the other decision of whether to take the annuity or the one-time lump-sum payment, the winner went for the cash payment of nearly $878,000,000. Her lawyer announced that she will be donating to a number of charities, including Hurricane Florence relief. Won Jan. 13, 2016. 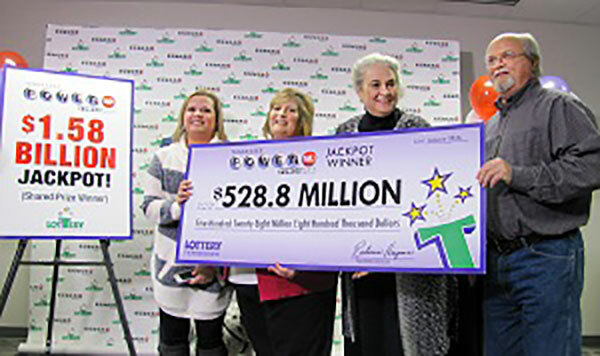 Winning tickets were sold in California, Florida and Tennessee, making the annuitized amount for each winning ticket nearly $528.8 million. The Robinson family of Munford, Tenn., showed up with their dog to claim their winnings. The Florida winner, who claimed her prize with a trust, told Powerball that she had been playing the same number for years before it finally paid off. The California winners said they did not wish to become public figures and had designated most of the money for a trust to benefit charity. "We are thankful and blessed for the rare gift that has been placed in our care. We have engaged a team of advisors to educate and guide us through this process so that we can be good stewards of these new resources," their statement reads. Powerball is played in 43 states, Washington, D.C., and the U.S. Virgin Islands. All amounts listed are the annuity option. Many winners choose the cash option. Editor's note: Powerball officials had initially listed Watertown, Massachusetts as the location of the winning ticket on August 23, 2017. Officials later corrected it, and this story has been updated to reflect that. What could you buy with $1.6 billion?